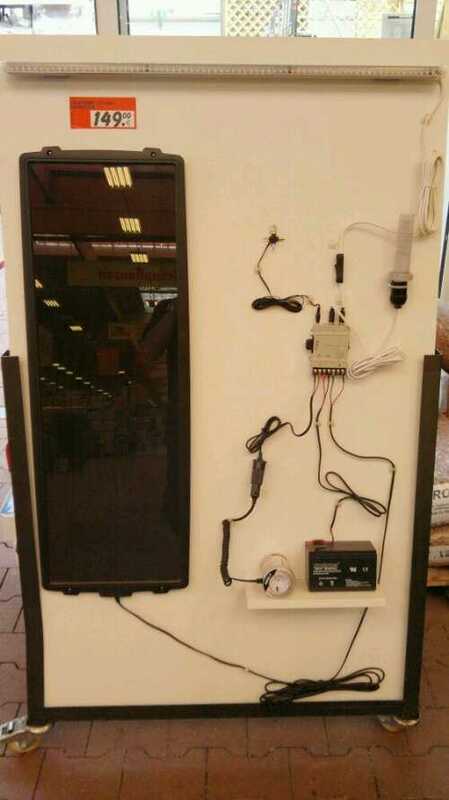 Spotted in my local hardware supermarket today was a surprisingly cheap 12v solar kit. The 15w solid panel was packaged with a regulator / converter that had various output voltages, two led lighting solutions and a 7ah 12v battery. The 220v inverter shown in the image was not included in the kit. While the build quality didn’t look that great, this would still be a good purchase for emergency use. The price also indicates that some mass manufacturing is starting for the consumer market now. Certainly the Summer 2011 edition of a local electronics catalogue shows way more solutions and products than just a few years ago. Have you seen more consumer solar equipment for sale this year? $200 for a 45w panel isn’t bad! For many of US in developed countries, only a large solar installation makes any real sense and to be honest, the larger the better. Small-scale solar operations are expensive and are only any use for experiments and education. For emergency use, small scale solar isn’t enough. Even for traveling, there aren’t many places we, the general public, go without power being available once per day. As for saving money, we can forget that with small-scale solar. In terms of computing we can do it within a 4w profile now. Charging up a few external power bricks would keep that computing experience going for a week or more! I guess I’m saying that there are very few uses for small-scale solar-powered computing!